On Being an Artist presents at Artcore the work of Andrew Bracey, Geoff Litherland, Jessica Harby, Kajal Nisha Patel, Tim Shore and Tracey Kershaw, who were selected to be part of Document, a project produced by the Contemporary Visual Arts Network East Midlands. For two and a half years the six East Midlands-based artists have shared their lives with each other and the public, exploring aspects of pursuing a career as an artist, from funding and career direction to self-doubt and work/life balance. The project sought to explore their motivations, shine a light on their creative processes and give an insight into how they pursue their practices. Crucially, it aimed to present an honest portrait of what lies beneath art produced in the East Midlands, from the artist’s point of view. Throughout the project they have each reflected on their ‘journey’, their thoughts and experiences being captured through film, writing, photography and discussion, a process that has produced a wealth of rich material from which to create a narrative for contemporary arts practice. Now these artists come together for an exhibition, building on their two years of behind-the-scenes discussions to construct a dialogue between artworks. These works are linked by direct and interactive connection with their audience and exploring the rules, processes, and boundaries of art itself. The artists are based in different parts of the region, are at different stages of their careers, have come to their practice by different routes and lead different lives. What unites them a commitment to their respective practices and to finding ways to communicate what they believe to be important. Most importantly, in a time of austerity, competition for funding, reduced investment in arts education, they demonstrate how possible and vital it is to be an artist in the East Midlands. As part of this exhibition, Artcore will screen a series of short films created by award-winning filmmaker Bill Newsinger about each of the Document artists, commissioned by CVAN EM for the project. 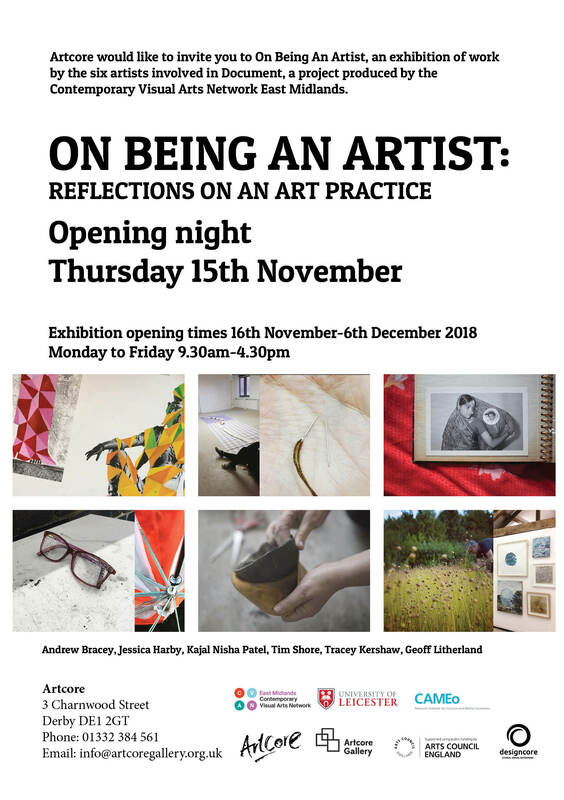 On Being an Artist: reflections on an arts practice will open on Thursday 15th November 2018 and be on display until the 6th December 2018. There will be an opening night event on Thursday 15th November from 6-8pm featuring talks from the artists, a tour of the exhibition, and some time for refreshments and networking. On Being an Artist: reflections on an arts practice is free to visit and can be seen Monday-Friday, 9:30am-4:30pm. If you are planning a visit, please email admin@artcoreuk.com for a tour of the exhibition.